A group of friends have come together to record a special song in order to fundraise for their friend, talented swimmer and passionate Dublin Gaeilgeoir Pádraig Schäler. The enterprising young people took part in a challenge swim, #SnámhPhádraig, in April this year when they swam in every coastal county in Ireland in the space of two days. They hope that this latest fundraising push will exceed the €37,000 they raised in that endeavor. There will be a special fundraising ‘Night of Music for Pádraig’ at Club Conradh na Gaeilge, Harcourt Street, Dublin on Tuesday 1st July and the recording will take place 2nd – 3rd July in Sonic Studios, Stoneybatter. They hope to release the song in August. Pádraig, 24 years old, was critically injured while on a J1 visa in Cape Cod, Massachusetts, on the 27 June 2013. He was cycling to work when he was hit by a van and he has been in a coma ever since. He had just completed his undergraduate studies in Trinity College Dublin, where he was studying Irish and History. After 2 weeks in intensive care in the US, his parents brought him home to Ireland. Eventually Pádraig’s parents took the decision to move him to Germany, where he is now receiving the treatment he needs and is making slow but steady progress. 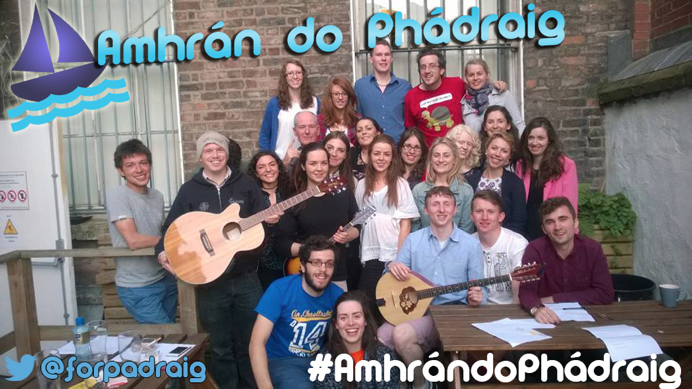 Pádraig’s friends have come together to record a bilingual song in honour of their friend, and in the hopes of raising money to help ease the financial burden that has been placed on his family. A special fund has been set up, ‘Caring for Pádraig’ and all proceeds from ‘Song for Pádraig’ will go towards the many and varied costs of Pádraig’s care. Beidh cairde Phádraig Schäler ag teacht le chéile le hamhrán speisialta dátheangach a thaifeadadh ar mhaithe le hairgead a thiomsú don Ghael óg aitheanta as Baile Átha Cliath. Ghlac na daoine óga tiomanta céanna páirt i snámh dúshlánach i Mí Aibreáin nuair a thaistil siad timpeall na hÉireann thar thréimhse dhá lá, ag snámh go misniúil san fharraige fhuar i ngach contae sa tír a bhfuil cósta aige. Bhailigh siad €37,000 le linn na heachtra sin agus tá súil acu an méid sin a shárú an uair seo. Beidh ‘Oíche Mhór Cheoil do Phádraig’ ar siúl i gclub Chonradh na Gaeilge, Sráid Fhearchair, BÁC, Dé Máirt 1 Iúil agus beidh an t-amhrán á thaifeadadh ar an 2-3ú Iúil in Sonic Studios, Bóthar na gCloch. Tá súil acu an t-amhrán a eisiúnt i Mí Lúnasa. Gortaíodh Pádraig, 24 bliana d’aois, go dona ar an 27 Meitheamh 2013 agus é ar víosa J1 in Cape Cod, SAM. Bhí sé ag rothaíocht go dtí a ionad oibre nuair a bhuail veain é agus fágadh i gcóma é ó shin. Bhí sé díreach críochnaithe leis an bhunchéim i gColáiste na Tríonóide, áit a ndearna sé staidéar ar an Stair agus ar an Ghaeilge. Tar éis do Phádraig coicís a chaitheamh in aonad dianchúraim sna Stáit Aontaithe, thóg a thuismitheoirí ar ais go hÉirinn é. Rinne siad an cinneadh Pádraig a bhogadh chun na Gearmáine ar deireadh, áit a bhfuil sé anois ag fáil an chúraim chuí agus ag déanamh dul chun cinn de réir a chéile. Mhínigh an píobaire cáiliúil agus cara le Pádraig, Maitiú Ó Casáide, an smaoineamh a bhí taobh thiar den amhrán: “Scríobhann athair Phádraig, Reinhard, blag laethúil ag www.hospi-tales.com. Is slí iontach é do chairde Phádraig gach dul chun cinn a leanstan agus é chomh fada ar shiúl uainn sa Ghearmáin. Tá an blag thar a bheith corraitheach agus chuaigh post amháin go háirithe i bhfeidhm orm. Scríobh Reinhard faoi bhrionglóid a bhí aige, inar thóg sé féin agus Pádraig bád le chéile. Bhí sé fíorálainn agus spreag sé mé chun amhrán a scríobh darb ainm ‘Bád na mBrionglóidí’. Tá Pádraig an-tugtha don gceol agus tá sé an-chairdiúil le neart bannaí ceoil. An plean atá ann ná cairde Phádraig ar fad a bhailiú le cheile agus amhrán a thaifeadadh dó atá lán dóchais. Is é an sprioc atá againn ná an méid is mó airgid gur féidir linn a thiomsú ach fosta lenár ngrá agus ár dtacaíocht a léiriú do Phádraig is dá theaghlach, le rá leo go mbíonn muid i gcónaí ag smaoineamh orthu, anois ach go háirithe agus bliain imithe tharainn ó tharla an timpiste”.